The Carolinas Credit Union Foundation and the Lowcountry Chapter of Credit Unions, with support from several credit union volunteers, hosted a successful CU Give Back Day at the Ronald McDonald House Charities of Charleston (RMHC) on October 22, 2018. 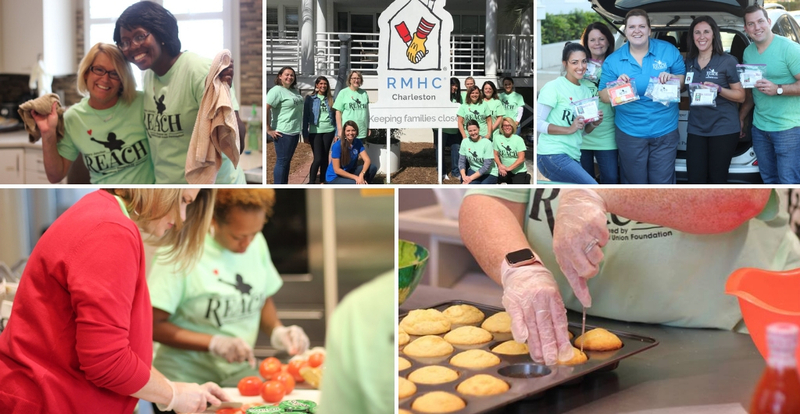 Volunteers prepared lunch and dinner for RMHC guests and their families, and cleaned the facility to help the house stay safe, organized and germ-free. Visit Facebook to view more photos from the event and read more on the Lowcountry Chapter's experience hosting CU Give Back Day. Credit unions in the lowcountry also worked together to donate nearly 1,000 Magic Kits for Victory Junction’s Reach Program, which delivers camp magic to children and their families in pediatric hospitals and Ronald McDonald Houses. Special thanks to all of the credit union volunteers from South Carolina Federal Credit Union, Heritage Trust Federal Credit Union, CPM Federal Credit Union, C.O. Federal Credit Union, Latitude 32 Credit Union and the Carolinas Credit Union League. During the Lowcountry Chapter of Credit Unions’ Annual Legislative Night, raffle proceeds of $1,500 were raised for Victory Junction’s Reach Program. To learn more about the Foundation’s Reach Program and how you can get involved, contact Lauren Whaley at 919-600-8219 or lwhaley@carolinasfoundation.org.